The good news: Danger Word is going into syndication via African American Short Films, where it will tour local TV and cable channels around the country for 90 days. Click HERE every Thursday to see when it might be playing where you live. The bad news: we have agreed to disable our YouTube link until the end of the run, so you can’t see the full film online until the end of September. 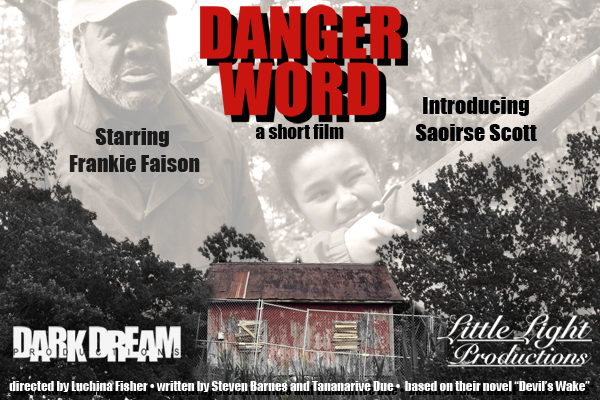 Danger Word was nominated for Best Narrative Short at the BronzeLens Film Festival and Pan African Film Festival in L.A., and it is also a selection of the Pan African Film Festival in Atlanta August 7-10. Check back here for Danger Word’s relaunch online–just a month before Halloween! Missed the film? Here’s the trailer. Full film back online September 28th. Danger Word is directed by Luchina Fisher. Co-written by Steven Barnes and Tananarive Due. See our Cast & Crew page to learn more about our great team! 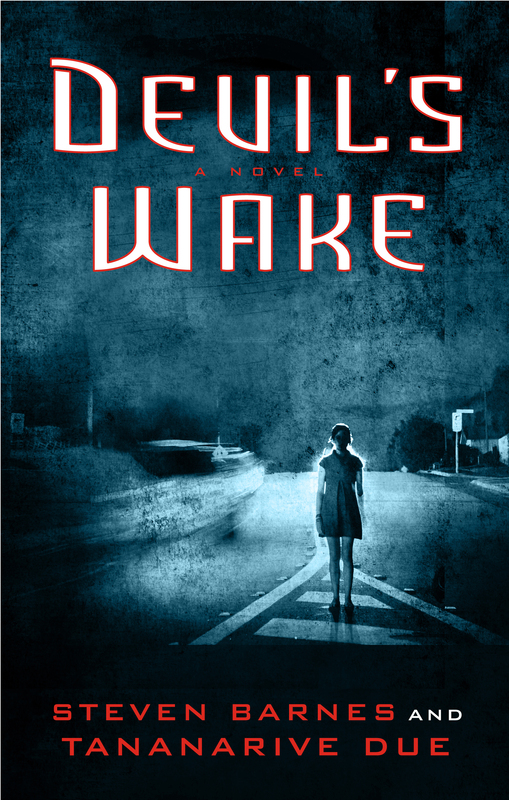 Writers and co-producers Steven Barnes and Tananarive Due have optioned their YA+ zombie novel DEVIL’S WAKE to Tonya Lewis Lee, Spike Lee’s wife and a producer at ToniK Productions. ToniK wants to produce a feature version of DEVIL’S WAKE! Lee first saw our short film adapated from DEVIL’S WAKE after Due met her at Atlanta’s Bronze Lens film festival last fall. She read both DEVIL’S WAKE and the sequel, DOMINO FALLS. Here’s ToniK’s mission statement: “ToniK focuses on diversity and women, developing original projects and adapting some of today’s top novels and biographies. At ToniK we believe in telling great stories that need to be told, with an eye towards authenticity. We are women. We are mothers. We are diverse.” So excited!!! Check out the ToniK website here: http://tonikproductions.com/home/ Let’s see what happens next! 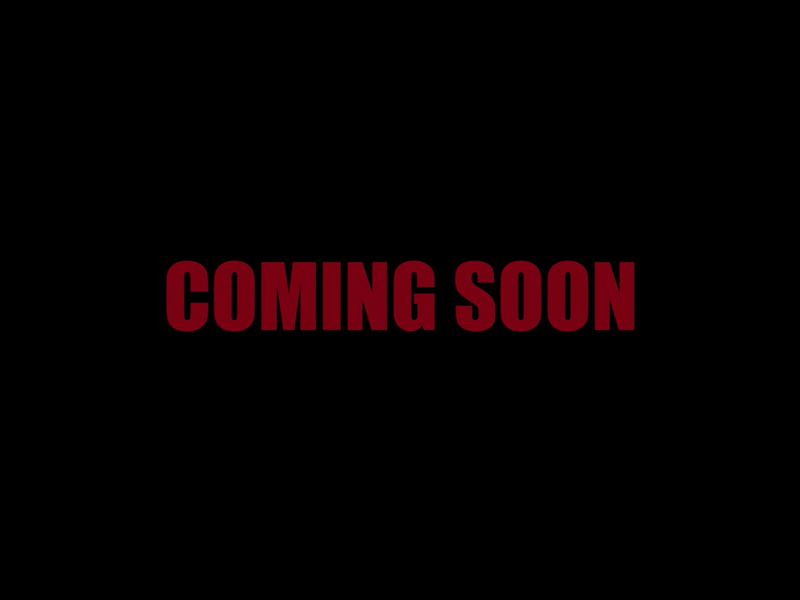 CHECK BACK HERE Monday, 4/28/14 for a link to the FULL FILM! Danger Word’s online release is AT MIDNIGHT Monday, 4/28/14. The URL www.dangerword.com will take you to the actual film instead of to the blog. You may continue checking the blog here at http://www.dangerwordfilm.wordpress.com. Join the Facebook Watch Party Page. Here’s our imdb.com page. You can also see stills and photos from our shoot on our Facebook page! 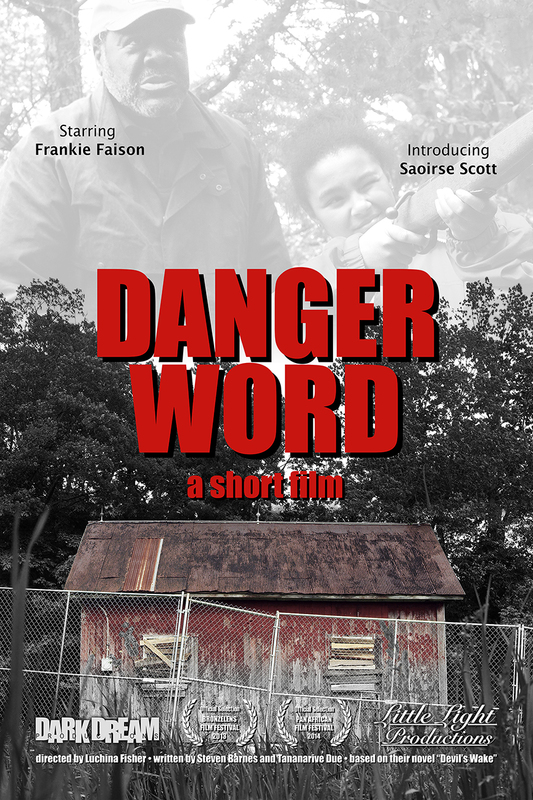 Danger Word was nominated for Best Narrative Short at the Pan African Film Festival (2014) and the BronzeLens Film Festival (2013). We have been busy. We had a great time at the BronzeLens Film Festival in Atlanta, where we were nominated for Best Short–and now we have been selected for the Pan African Film Festival in Los Angeles (Feb. 6-17). We will also have more news soon about “Danger Word” and the YA horror novel it was adapted from, Devil’s Wake. Thank you so much for your patience. I know you are eager to see the film, but we are submitting it to film festivals before we can make it available to the public. You definitely will have a chance to see it in 2014! And here’s our official poster! Our world premiere and our first film festival: BronzeLens Film Festival of Atlanta! IT’S OFFICIAL: We’re still racing to finish the sound edit and final cut, but Danger Word is an official selection of the BronzeLens Film Festival of Atlanta Nov. 7-10. THIS WILL BE OUR WORLD PREMIERE. We’re so excited to be a part of a festival that will include work from Nelson George, Steve Harvey, Whoopi Goldberg as Moms Mabley and a talk-back with Alice Walker! And what could possibly compare to seeing Danger Word on a big screen? More details about the screening schedule TBA. Co-screenwriters Steven Barnes and Tananarive Due will also give a talk on writing horror. Hope you can come see the film you helped us make! Check back here for more details. We are funded! Thanks to you…and mother-daughter backers Alma and Allo Greer! 7/30/13 update: WE ARE FUNDED and no longer on Indiegogo. But you may still contribute on this site. We’re days away from the deadline for our post-production fundraising drive on Indiegogo–and by last week, we were worried. But now two guardian angels stepped in with back-to-back $5,000 contributions–and we can finish the film you helped us get started. Meet Alma Greer and Allo Greer, our new co-producers. They are mother-daughter book lovers from Detroit. As the opening credits roll, after Dark Dream Productions and This Little Light Productions, a card will read In Association With…and the company names of their choice. We are so thrilled to have them aboard! Last Friday, our Indiegogo total sat stubbornly below $2,500 and we needed to raise $10,000 more. Our campaign had started strong, but slowed. (We’re told that July is not a good month for fundraising.) And we had raised our production budget to shoot the film ($15,000) through Facebook and social media–before we began our post-production campaign on Indiegogo. Maybe our friends, readers and family had given us all they could. It was already a miracle we had come so far. But we knew potential contributors would be discouraged by the gap to our goal. Had we reached the end of the line? At noon Friday, July 12, the producers had a conference call–director Luchina Fisher, screenwriters Steven Barnes and Tananarive Due, and producer Zainab Ali. We needed a strategy. Oscar-winning screenwriter Geoffrey Fletcher, visiting Spelman College last fall, told students: “You have to have a Plan B and Plan C to make Plan A jealous.” It was time to come up with a Plan B.
Twenty minutes after we hung up, Allo Greer contributed $5,000 to Indiegogo. We were stunned. Two days later, her 80-year-old mother, Alma Greer, donated another $5,000 to match her daughter’s contribution. Suddenly, we had the $10,000 we needed. We were speechless. We still are. Why doesn’t the total show up on Indiegogo? Because for a very large contribution–so we have learned–Indiegogo has a rigid verification procedure. The first $5,000 was temporarily withheld from our account. Monday, the hold still was not resolved. Tuesday, Allo Greer decided to contribute to Danger Word through PayPal instead. Thursday, her mother followed suit. So the fundraising total you see to the right is our actual total. 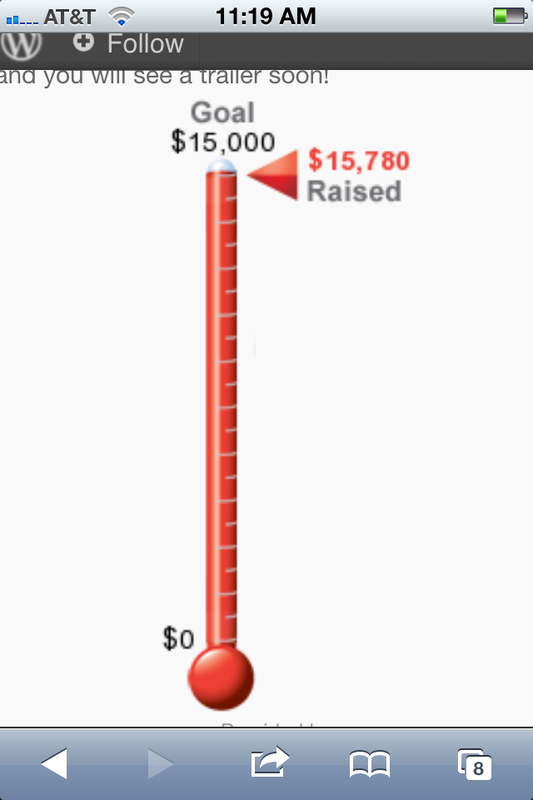 The total on our Indiegogo page is only a fraction of that. Thanks to you and Alma and Allo Greer, we have come so far! Some Indiegogo visitors will see our low total and believe our post-production campaign is failing. Or that we won’t be able to finish the film. Not true at all! We will finish Danger Word. Every dollar we raise now will be used for marketing and publicity, film festival fees and to establish production offices for a feature film version of the novel Devil’s Wake, where Kendra’s story first appeared. We already have invitations to the Charlotte Black Film Festival and Atlanta’s BronzeLens Film festival. Next stop…Sundance? We are moved and grateful beyond words. Thanks to all of you–and our new co-producers, Alma and Allo Greer–for helping us make a beautiful film together. Want a T-shirt? Or to be a producer? Click on the photo to go to Indiegogo! Danger Word has been covered in Shadow and Act, The Huffington Post, MSNBC’s “Melissa Harris-Perry” and The Grio. We’re more than halfway there! Since March, more than 200 contributors have visited this site to give between $1 and $1,000 toward the filming of Danger Word, which was shot over Memorial Day weekend (2013). Primarily using Facebook and social media, we pulled off a tiny miracle through “community funding”–thanks to you! Now we’ve moved our fundraising effort to the crowd funding platform Indiegogo for Phase II: post-production. That’s the phase where we improve the images and sound to create a film that can be exhibited in the company of quality films. (Who knows? Maybe even at Sundance!) Right now, all we have is raw footage of great performances from our stars Frankie Faison and Saoirse Scott. Technical experts will take Danger Word the rest of the way. Even if you can’t give now, or have already given, please SHARE the site with your friends and family. Can you help us spread the word about Danger Word? We will have an exciting new gift to offer soon! And we have added a free PDF of the screenplay for contributors who give $25 or more. The site will also soon expand to offer a NEWS & PRESS page: Danger Word has been covered in Shadow and Act, The Huffington Post, MSNBC’s “Melissa Harris-Perry” and The Grio. Thank you for helping us make the dream real! Danger Word film: we have a TRAILER! Presenting…the first public footage from Danger Word, which we shot with community funding over Memorial Day weekend. 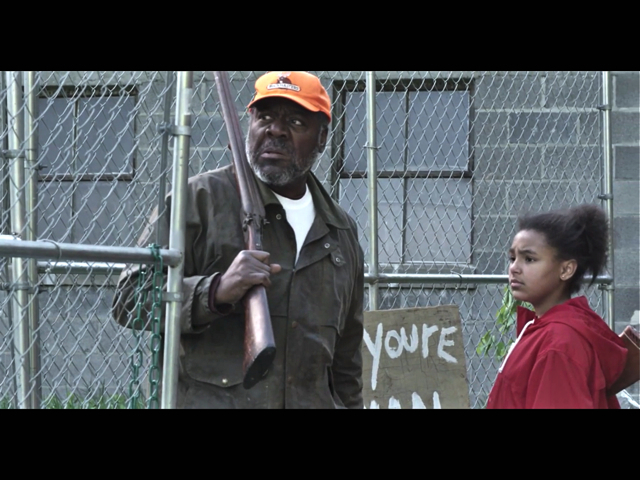 Danger Word co-stars veteran actor Frankie Faison (The Wire, Banshee, The Silence of the Lambs) and promising newcomer Saoirse Scott (One Life to Live) as a grandfather and granddaughter who have survived the zombie plague in his wooded cabin…and how her birthday goes awry. This trailer was created by our talented editor, Terence Taylor (also a horror writer!). We think it captures the character-driven nature of our scary little movie. We have launched our pre-production campaign to finish this film. To contribute to Danger Word, click here. We wanted to make a short horror film, and we believed we could fund it within our own community of friends and strangers who shared our dream of creating a story and characters we could be proud of. We met our Phase I goal! Now we have moved to Phase II. Phase I was for preproduction/production, and Phase II will be for post-production. (Until our Indiegogo campaign is set up, we will continue to raise funds on this website.) Our Phase II campaign will be for $12,500–not quite as much, but still costly to pay for the professional technicians and editors who will make this short film look and sound as good as any you would see in a movie theater. Click here to contribute to the post-production campaign. For a longer explanation of how production costs work, read on. For now, we just wanted to say thank you!!!! The first $15,000–what we called Phase I–went to cast, crew, equipment rental, location rental, makeup and F/X, transportation, and maintaining the set during production. That is “pre-production” and “production” expense, and it came to about a thousand dollars a minute! (By contrast, a Hollywood movie averages a million dollars a minute!) Our director/co-producer Luchina Fisher stretched ever last dollar to the breaking point, and wrung every last scrap of value from every last penny. Now we move to Phase II, known as “post production”—color correction, sound balancing, music, editing, ADR (dialogue replacement often used, for example, in moving vehicles), deferred travel expenses and the like. This is where we take the raw footage and assemble it into a trailer, and then a movie. These two phases were designed to be “crowd funded” (or, as we like to call it, “community funded”). Phase II will soon shift to a more “public” vehicle, Indiegogo, where the strength of our trailer will help us move beyond the circle of our friends, fans, and family to show our newborn child to the world. Those who have contributed already—bless and thank you. We ask only that you keep us in your hearts, and share the Indiegogo link with your friends, Twitter streams and Facebook friends when we launch. The trailer will be ready soon! Can’t wait to share it. Thank you again for making this magical journey possible for all of us. Click to sign up and receive the latest updates!